The federal deficit reached $691 billion through the first six months of the 2019 fiscal year and is already higher than the full-year deficits in the final two years of the Obama administration, The Hill reports. Data released by the Department of Treasury shows that the government has spent nearly $700 billion more than it took in between October and March. 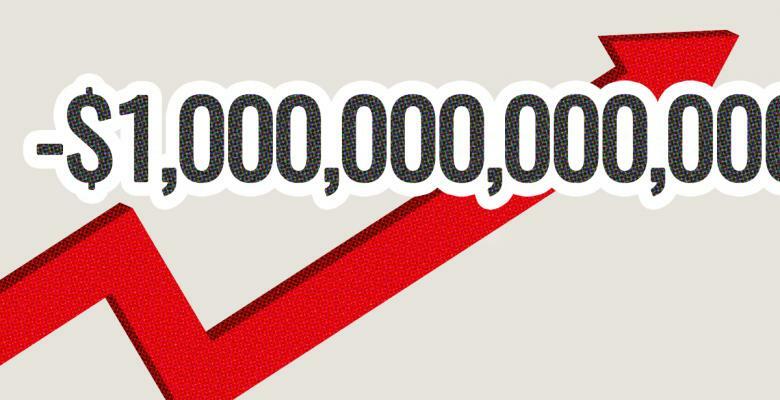 The Treasury projects that the deficit will hit $1.1 trillion when the fiscal year ends on September 30. The $691 billion deficit is higher than the full-year deficits that the country saw between 2015 and 2017. The increase in the deficit is mostly the result of the Republican-passed 2017 tax cuts, as well as record military spending increases by Congress. Republicans in Congress are pushing to extend the tax cuts, which are fueling the deficit, as well as to increase defense spending, which is also fueling the deficit. Democrats are calling for an increase in nondefense spending. The Peterson Foundation, a budget watchdog group, warned that the increases could pose a "significant risk to our economy and to every American's future." The payments on the United States’ ballooning federal debt have hit $190 billion through the first six months of the 2019 fiscal year.